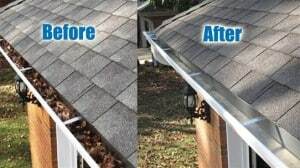 Gutter cleaning is an inexpensive and yet indispensable exterior facility service that will save home owners and property managers thousands of dollars in property repairs down the road! Do you know that a clogged gutter will cause water to overflow between the gutter and fascia board of your house and cause damage to your property? Call us today for professional help - 780-919-8399. When rain falls or the snow on your roof melts, gutters play an important role in channelling water away from your house and its foundation. They are indispensable for protecting your property from all types of damage. If a gutter is damaged, stagnant water can start to accumulate and cause more problems. get up close and personal with your gutter to ensure no debris is left behind. Our gutter cleaning services come with a satisfaction guarantee. Whether your home or facility is a one-bedroom house or a multi-tenant condominium complex, KARIS Services gutter cleaning technicians can deliver the same high quality service you should expect. Our gutter cleaning technician are well trained and take pride in their job. We are here to keep your gutters in good condition! Call KARIS Services today at (780) 919-8399 to make an appointment.